During a recent run in preparation for the Sun Run, my friend used an app to track calories burned throughout the run. The app read “510 calories burned”. My immediate response was “oh, so as much as one Big Mac!” However, my friend immediately disagreed with me, claiming a Big Mac contains at least 800 calories. In complete disbelief of the situation, I decided to do a little research…. Although I was a little skeptical with my estimate at first, turns out I wasn’t far off in the first place. A local Big Mac comes in at 520 calories. (Not too bad, considering one of the unhealthiest foods in the world. ) In fact, the Big Mac actually contains a variety of core nutrients that are necessary for a healthy life. The Big Mac is a great source of Protein, Iron, and Vitamins. Especially for bodybuilders, and fast twitch athletes who require a large amount of protein and iron to fuel them through their workouts. Also, despite the many beliefs, the Big Mac only contains 9 grams of sugar! Protein- With 24 grams of protein, the Big Mac can help contribute to helping the mitochondria generate power for your body! Iron- Containing 35% of the daily value, one Big Mac can put a substantial helping hand in improving blood circulation! Yes, of course the Big Mac still isn’t a “healthy” food. Unfortunately, there are still many unhealthy nutrients present in a Big Mac. 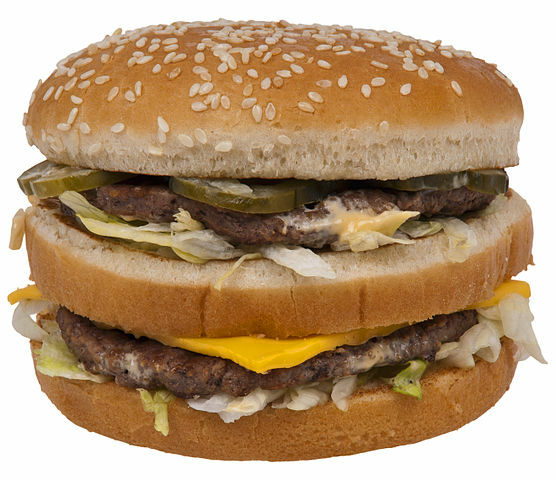 Overwhelming amount of fat: One Big Mac contains a whopping 28 grams of fat, and 10 grams of saturated fat. Which is half of the recommended daily intake. Furthermore, this leaves really little space for intake of other foods that may contain fat. As a result overconsumption of fat can lead to raise of cholesterol that may eventually end in heart diseases. The high quantity of fat pretty much counteracts all the healthy nutrients present in the burger. Sadly, this also means that you won’t be able to eat Big Macs for the rest of your life…. Personally, I am not the biggest fan of the Big Mac, or burgers in general. However, I am still a big fan of bing eating, and I think it is helpful to know the consequences of these actions… Despite that, I believe that it is still important to treat yourself from time to time. So next time you’re at McDonald’s, don’t hesitate and bite into those burgers!